Today I decided to write something different. I would like to initiate a discussion and find out how do you access the Steem blockchain. Do you use your mobile or laptop? Some possibilities of how to access the blockchain. 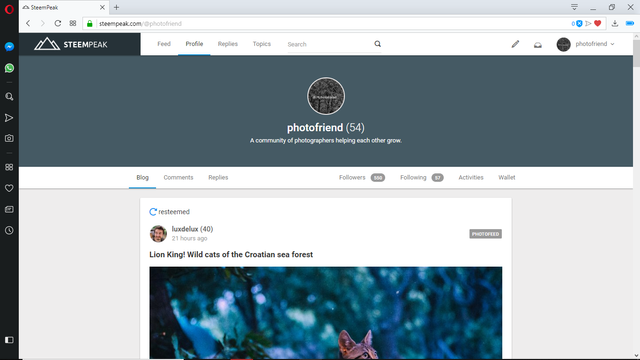 The best page to get all the information about each account is https://steemworld.org/@photofriend from @steemchiller. Where do you write your articles @misan? At the beginning steepshot tried. Because I don't want to hand out my keys everywhere. I use my phone and very rarely the pc. So far I tested pretty much every app Steemit related: busy, eSteem, steemworld, steemd, steepshot etc. 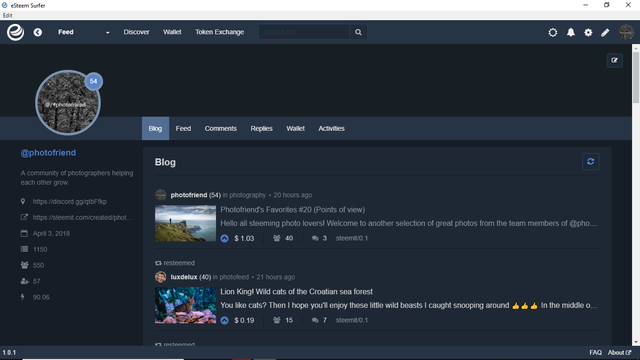 Currently, I use eSteem for posting, voting and commenting and Steemit site for editing my posts (it works a little better than eSteem who often gets stuck and does not show the preview accurately). On busy I check the notifications. Steemworld shows me who upvoted my posts, comments, mentions and different stats. A good feature of eSteem is the fact that I can select the percentage of the upvotees I give (in the past I always exceeded the bandwidth as too many 100% upvotes given). I like the upvotes from eSteem far to much to switch! Yes, this is one of the main features that brought me here. I use my desktop for all writing and publishing, simply because all my many drives with all my photos are linked to my desktop. I use steepshot and busy equally as much as I use steemit. Love steepshot because its easy for the photos where the description is brief. I also have the steep shot option on my smartphone for quick posting of a photo although I don't use that function too often as I like to view my photos fullscreen first and edit or straighten the image prior to posting. 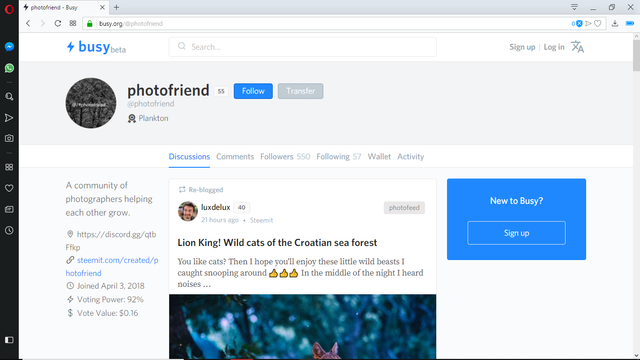 Busy is nice for all the additional features and functions, but steemit also gives you this info if you are logged into SteemPlus. To be honest I have not heard about steemspeak up until now! wow, just learned something new and I will go and check it out. 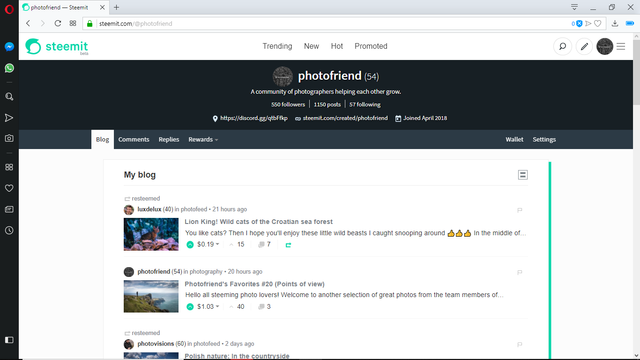 I always use my iPad and go through google chrome to access Steemit. steemit.com and busy.org are my go - to sites for posting. I use busy and also ulogs(basically busy) for writing my post on laptop. For photos i use steepshot desktop application. I don't use mobile a lot and didn't quite like the esteem. I have tried steempeak but busy is the best for me. Oh and I recently used for the first time tasteem.io for a restaurant guide contest! It's nice but I didn't like that the pics I uploaded lost quality; but appart from that, the app is pretty cool for restaurant reviews posts, how they show the ranking, details and stuff! Have you tried it? Steempeak is a new for me and looks like interesting with their features and very nice look. I use @eSteem on my phone and would be using Surfer if my laptop wasn't so darn slow! I'm impatiently waiting for @good-karma to come out with the web version. Nothing else compares to @eSteem, in my opinion. @melinda010100 I use esteem on laptop only. Good to know it works on phone too. It is pretty fast on my laptop. This also allow me to have chrome open. @esteem Surfer is fast....it is my old laptop that is slow! There is an update to the phone app coming out soon. I'm quite excited about that! The reason is if it is on my phone I will never get off of here.